Hey everybody. I spent a long time on this and I really like it. Probably better than last year’s Ode To the Stain On Your New Rug. Anyway, if you like this and feel like forwarding it on to anybody else you know, I’d consider it a compliment. Thanks a ton. All the pieces neatly fitted, shaped to form an inner core. So the pieces came together forming thence a champion core. “Praise the Lord” quoth Baltimore. Twere not many fans a-grinning for a team which could not score. It’s already been three games, and still the touchdown drought remains. The city started pointing blames; they could not take this anymore. Then they turned to this Dilfer guy and gave his head and arm a try. The city loved him for he’d cry; he’d cry and we’d not know what for. Maybe twas his second chance at Tampa he was longing for. We’d speculate, but never sure. For still the end zone was not found; they hadn’t seen it since week four. And searching for his team’s reprieve, dove to the pilon for the score. The city cheered unlikely heros, for the Ravens found a score. This whole city started glowing; something special was in store. Then the Ravens spoke their credos: “Who out there thinks they can beat us? “Who among you will defeat us? This, of you, we do implore! And though Dallas came in hot, they went home without having scored. But not even mighty Eddie put a C-note on the board. Corey, Fred and even Eddie still fell short on the scoreboard. Then the regular season ended, but the Ravens’ was extended. All vacations were suspended, playoffs knocked upon their door. The Raiders, they jumped ship and bailed for them there pirates lost the war. Even armed with Gannon’s cannons, still the Raiders lost the war. Except that prophet Sterling Sharpe, whose bald head we all still adore. A position which the Giants likened with from weeks before. Both the Ravens and the Giants, underdogs in weeks before. Twas to be a Superbowl to which reporters called a bore. Most had thought they’d come out mellow; some, I’ll bet, saw them as yellow. But hey! There’s that Stokely fellow granting them an early score. Brandon Stokely once again would give the birds a needed score. Then New York began to stumble, still the Ravens would not crumble. That record-setting defense got four picks and would not heed a score. Marvin Lewis, cool all through it, breathed a sigh he’d not before. All the city cheered a cheer they’d never got to cheer before. And all the fans would storm the streets from Fells Point to the Harbor shore. Well, I went out to see one of the possibly 10 best movies I’ve ever seen on Friday. I was all prepared to come back here and tell everybody how awesome The Gift was, which I still might do… But then I saw what I’m now considering my new favorite movie. It’s replacing The Sixth Sense. It has to. The Sixth Sense gave me major chills. This one gave me the same chills and made me hyperventilate in a way that I thought I was having an episode. And I know I lost some degree of respect when I gave Unbreakable as high a rating as I gave it, but this is the real thing. 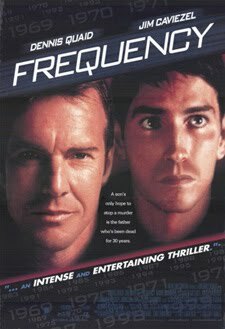 Go see Frequency NOW! Bring a paper bag. Here’s the premise. It’s 1999. There’s an old guy who can mystically communicate with his dead father in 1969 on a ham radio. I know, I know. You just have to accept the premise and move on. Like Quantum Leap or Back To the Future. Or the electoral process. Why 88 miles per hour? No, it doesn’t make sense, but no one has ever time travelled yet to the knowledge of the greater public. That’s another great thing about the concept of time travel in a film. Nobody’s really gonna pose a serious argument that it wouldn’t happen that way. “There’s no way dogs can see Dean Stockwell, that’s just silly.” “I seriously doubted that if Old Jennifer saw Young Jennifer that it would begin a chain reaction that would unravel the very fabric of the space time continuum.” So yeah, just accept it and move on, OK? It’s for your own good. I don’t want to ruin the movie by going into detail, but let’s just say that (as you would expect from a time travel flick) the son from the future tells his dad (Dennis Quaid) some info that helps him avoid his death, but then in turn, creates a chain reaction that does bad things to a lot of people. So he has to help dad try to put right what went wrong. And I know I said that there can’t really be any room for argument about time travel, but it does need to be at least consistant with itself for the duration of the movie. This storyline seems to be air tight to me, and it’s extrememly well written. And while nobody ended up sleeping with their own grandfather in Frequency, it was still a good romp. I’m giving it the new highest ranking of what would be the equivalent of a number whose limit is approaching 11 bugs from above, hence bringing it as close as you can get to 11, but still being a little bit higher. For those of you who aren’t math nerds, that’s 11. So the Ravens are in the Superbowl. And they’re playing the Giants. I’ll bet a lot of bookies are making a lot of money right now. If things keep going well for them, Trent Dilfer will be the worst quarterback in history to ever win the Superbowl. I wouldn’t mind that title. But it looks like I’m going to have to wait at least another year to get it.